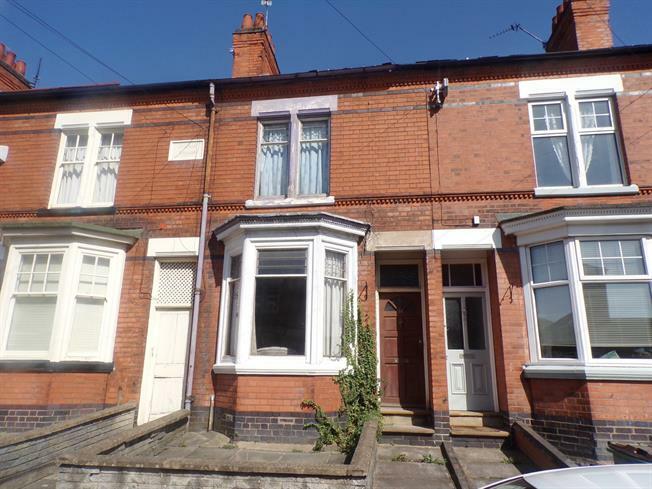 2 Bedroom Terraced House For Sale in Leicester for Asking Price £165,000. Investment Purchaser Preferred This two bedroom Victorian villa town house is pleasantly situated within the highly sought after location of Oadby. The accommodation requires further improvements and comprises of main entrance hall, two reception rooms, kitchen, landing to two bedrooms, bathroom, rear garden. Ideally suiting an investment purchaser viewing comes highly recommended via the agent. Main entrance hall with wooden front door, leading to. First reception room with single glazed bay window facing the front aspect. Gas fire, carpeted flooring, coving, ceiling light. Ample storage space under stairs. Second reception room with single glazed wood window facing the rear aspect overlooking the garden. Radiator, carpeted flooring, ceiling light. Kitchen with wooden back door opening onto the garden. Single glazed wood window facing the side aspect. Radiator, ceiling light, base units, sink and drainer, plumbing and space for washing machine. Access from second reception with stairs rising to landing area. Single glazed wooden window facing the front aspect. Radiator, carpeted flooring, ceiling light. Single glazed wooden window facing the rear aspect. Radiator, carpeted flooring, ceiling light. Bathroom suite with single glazed wooden window with frosted glass facing the rear aspect. Radiator, vinyl flooring, ceiling light. Low level WC, bath, shower over bath, pedestal sink. Rear garden / yard with walled and fenced borders, lawn area and pathway, gated side access.